Corrigan Police Arrest and Charge Young Man in 2015 City Park Fire, CORRIGAN, February 24, 2017 - An arrest has been made and suspect charged in the fire of Central Park in Corrigan that took place on March 3, 2015. On that day, an early morning fire (5:40 am) was reported. Don Herman Botley, Jr., 22, of Corrigan, has been arrested and charged with arson (felony). 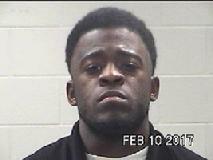 Botley had been arrested on February 10 for criminal trespassing. That arrest, in conjunction with the ongoing investigation into the park fire led to the charges against Botley. Botley is facing also facing charges for criminal mischief, criminal trespass, and assault causing bodily injury. The park fire was declared a total loss.